Bonus: the new $400 router and satellite kit has a pleasant, friendly aesthetic. One of the most frustrating first world problems today is not being able to connect to your home WiFi network in spots that are farther away from your router. Netgear believes it can get rid of that problem with its latest product: a WiFi system called Orbi. The $400 basic kit comprises of a router and a satellite that the company says will cover up to 4,000 square feet together. Orbi's standout feature, said Netgear, is its tri-band mesh system that dedicates one channel to extending the internet from the router to the satellite while keeping the other two free for your other devices' connections. The Orbi system is also designed to be easy to set up. Not only has Netgear created an uncomplicated, browser-based installation program that you can access through your phone and your computer, but it has also made it simpler to figure out where to place the extender. First of all, the router that you plug into your gateway has a sky blue top, while the satellite is white on top. After you plug in the router and are bringing the satellite around your house to find a good spot for it, a halo at the top glows magenta, amber or blue. Respectively, the colors indicate if you are out of range, if the signal is in range but weak and if you are within a good distance from the router. So it's basically a visual game of hotter or colder. In other WiFi products, extenders and routers connect to each other over the same channel as your laptops, smartphones and other devices, said Netgear. This contributes to the overall slowing down of your connection speed. As you add more extenders, having the dedicated 5GHz channel for the satellite and router and the remaining two (5GHz and 2.4 GHz) open for your other gadgets prevents the speeds from dropping as you spread the signal throughout more parts of your abode. To keep things simple, Netgear unified the network ID for both bands so you won't have to pick between the two. Of course, your internet speed will still depend on your use and the number of devices trying to get on the same network, but Netgear's new system does sound promising. We'd have to see Orbi in action to know if this setup helps. 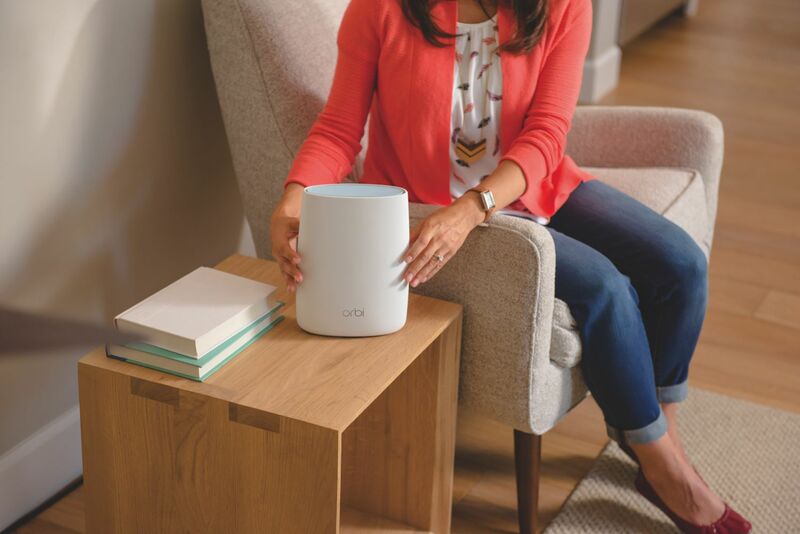 Orbi supports 802.11 ac WiFi up to 3 Gbps, and both the router and satellite come with four Gigabit ethernet ports and a USB 2.0 jack on the rear. You'll also get parental controls that let you blacklist or whitelist specific websites as well as set time permissions, along with a slew of more advanced features that you'll also get with Netgear's high-performance Nighthawk router. The Orbi still has to contend with the likes of Eero and Luma when it comes to range extension in the home, and Google's OnHub is a similarly user-friendly and pretty device. But Netgear is a well-known and established brand in the US, so the Orbi could very well outdo the competition in performance when it comes out in September.